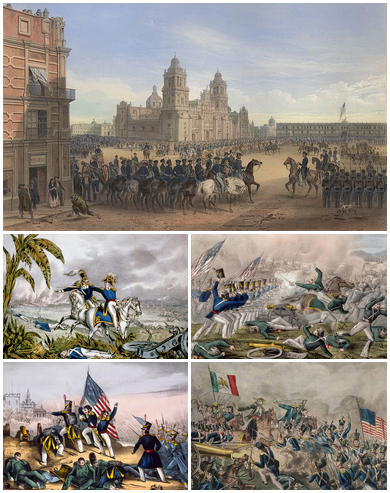 During 1846, even as war with the United States loomed, Mexican politics remained tumultuous. Mariano Paredes had come to power in late 1845 as part of a conspiracy to convert Mexico to monarchy. He backed off of his monarchist pretensions upon becoming aware of how genuinely unpopular the notion of kingship was in Mexico. Still, the very threat of a return to such a despised system was enough to fire up the puros, who believed that a return to the federalist Constitution of 1824 was the ticket to victory in the war with the United States. Confident of this prescription, the puros became by far the most strident advocates of war. Indeed, they have the distinction of being virtually the only group that seemed actually to believe Mexico could win—but victory, in their view, would be possible only under the proper political system. Puro leader Valentín Gómez Farías was the most ardent champion of war and federalism. So intent was he on dumping Paredes that he was willing to deal with the devil. In 1846 he began a regular correspondence with his old nemesis, Antonio López de Santa Anna, who had been exiled from Mexico “for life” in 1845. Santa Anna was presently devoting himself to banquets and cockfights in Cuba. Gómez Farías believed that he and Santa Anna would make an unbeatable governing team: Gómez Farías claimed to have influence over the masses, while Santa Anna held sway with the army. Gómez Farías was not Santa Anna’s only potential route back to power. At the same time he was parleying with the Mexican puros, Santa Anna was also putting out feelers to their archenemies, the Americans. In February 1846 a U.S. citizen named Alejandro José Atocha visited President Polk claiming that Santa Anna had expressed a willingness, upon being restored to power, to make remarkable concessions: the Rio Grande boundary and all of modern-day New Mexico and northern California, in exchange for a $30 million indemnity. It was an attractive offer, but Atocha was a shady character. Polk was skeptical but was nevertheless persuaded that Santa Anna would be more conciliatory than Paredes. If some subtle way could be found to help Santa Anna make his political comeback, Polk was on board. The liberals launched their rebellion in late July, even as U.S. forces were occupying California, preparing to occupy New Mexico, and plotting strategy in northern Mexico. When General José Mariano Salas joined the revolt in Mexico City, Paredes was finished. Paredes had been heading north to take charge of the army but was arrested en route. Salas became provisional president, but pending Santa Anna’s return, Gómez Farías exercised the real power. In August 1846 the federalist Constitution of 1824 once again was declared to be the law of the land. Ever the man of action, Santa Anna spent only two weeks in the capital before sallying northward at the head of three thousand ragged troops. In his absence he was elected president, and after some ugly politicking Gómez Farías became vice president, with power to govern while Santa Anna fought. General Juan Alvarez, a caudillo of southern Mexico who was among the few bold enough to openly oppose the war with the United States, sized up the new regime’s chief problem nicely. “Money, money, and more money,” he wrote, “are the three things which are needed in order to recover [Texas], save California … and preserve our nationality.” Mexico’s treasury, as usual, was bare, its normally meager revenues made more meager still by the U.S. blockade. The government decreed a barrage of emergency taxes and demanded contributions from the states and from urban property owners, but it lacked the means to collect such exactions or to deal with the fierce resistance they engendered. The Catholic Church, with its apparent opulence, was as always a tempting place to look for funds. As a liberal of conviction, Gómez Farías was famously hostile toward the church, not merely for its wealth but because of the formidable obstacle it presented to the creation of a modern, liberal, secular nation-state. As he had done during his 1832–33 government, Gómez Farías attacked the church frontally. On January 11, 1847, he persuaded congress to authorize the government to raise 15 million pesos for the war effort by mortgaging or selling church property; he made exceptions for church schools, hospitals, and charities. The clergy loudly protested the measure, and they had plenty of support. Demonstrators threw stones at the National Palace, leaflets advocated death to congress and Gómez Farías, the churches of Mexico City suspended services in protest, and pulpits thundered with antigovernment jeremiads. Several states in the center of the country denounced the measure as ruinous not only to the church but to all those businesses, ranches, and farms that had borrowed money from church coffers. Zacatecas went so far as to advocate overthrowing the federal authorities and negotiating a quick end to the war with the United States, while the governor of San Luis Potosí asked the legislature to declare his state’s independence from Mexico. There were even rumors that Zacatecas, Durango, Sinaloa, and Tabasco discussed declaring their independence from Mexico and asking for U.S. protection. The crisis worsened when the puro governor of Mexico City, boldly declaring himself an atheist, sought to ignore some of the tax exemptions for charities and hospitals that had been mentioned in the January 11 law. In late February, when Gómez Farías ordered a conservative militia battalion—known as los polkos because of their fondness for dancing the polka—to prepare for the defense of Veracruz against an anticipated American invasion, the polkos refused to go. Instead, with moral and financial support from the church, they began a rebellion that plunged Mexico City into a condition just short of civil war. They denounced Gómez Farías for surrounding himself with the “most wretched and despicable [men] from among the dregs of all factions.” They first demanded the repeal of the offensive tax laws and the dissolution of the executive and legislative branches of government but eventually said they would settle for the dismissal of Gómez Farías. The polkos had little popular support. Many residents of the city did not fail to notice the appalling cynicism involved in sparking such an upheaval at the very moment when Mexican troops were battling the Americans in the north and when American forces were preparing to land at Veracruz for a march on the capital. The church seems to have lost some prestige because of its role in the polkos affair: few people turned out for the Holy Week celebrations later that year, and most did not even doff their hats out of respect as the religious processions passed by. As had often happened previously in such situations, many looked to Santa Anna for salvation. At a critical moment Santa Anna abandoned the fight in the north and returned to Mexico City. People cheered and threw garlands of flowers in his path as he approached the city in late March. Just as he had done in 1833, Santa Anna now took the side of Gómez Farías’s enemies: he persuaded the church to lend the government one and a half million pesos in exchange for the nullification of the offending tax law, while at the same time he withdrew his support from Gómez Farías. He pressured congress to simply abolish the office of vice president, and the stubborn Gómez Farías had no recourse but to step down. A Santa Anna crony, General Pedro María Anaya, became substitute president while Santa Anna prepared to continue fighting the war. While the politicians wrangled, the war continued along its disastrous course. In June 1846, only a month after the U.S. declaration of war against Mexico, the Mexicans received the unwelcome news that the United States and Great Britain, after some moments of high tension, had patched up their differences over the Oregon Territory. Many Mexicans had hoped that that dispute might lead to war between Great Britain and the United States, which could conceivably have resulted in an Anglo-Mexican alliance. Instead, Britain rapidly lost interest in Mexico’s plight, and the United States was free to pursue its war with Mexico with one less distraction. Zachary Taylor’s army won victories at two battles just north of the Rio Grande—Palo Alto and Resaca de la Palma—in early May 1846, and his troops took Matamoros without resistance. The Mexican forces withdrew to the city of Monterrey, about two hundred miles west of Matamoros. At that point, hampered by the departure of volunteers serving short-term enlistments and by lack of supplies, Taylor bided his time until fresh troops and supplies arrived. On September 20 Taylor’s forces laid siege to Monterrey, forcing the Mexicans to capitulate after four days of fierce street fighting. A new force under General John E. Wool linked up with those of Taylor in February 1847, even as General Santa Anna was taking over the Mexican war effort. Santa Anna, upon returning to Mexico, had hastily assembled an army practically without funding. He mortgaged his own property, cobbled together his own resources, and pressed the peons from his own haciendas into service. In San Luis Potosí he seized bars of silver from the local mint, most of which belonged to Spaniards. None of this was sufficient to form a credible fighting force. Santa Anna’s army had no uniforms, little food, inferior weapons, and little training. The lack of artillery and long-range rifles meant they could fight only at close range, but the formidable U.S. artillery was capable of slaughtering them ruthlessly at a comfortable distance, making it nearly impossible for the Mexicans to mount an effective charge—a disadvantage that would cripple Mexican military efforts throughout the war. Statesmen in Mexico City might make much of Mexican “honor,” but for the rank-and-file soldier national honor was a hopeless abstraction that provided scant incentive for wanton self-sacrifice. And if death on the field of battle seemed less than glorious, for many such a death would have been a luxury: of the 20,000 or so troops Santa Anna assembled at San Luis Potosí, nearly five thousand perished of hunger, thirst, exhaustion, and exposure during the grueling 240-mile march north to Saltillo. Thousands more would die on the march back. Even despite the appalling losses, Santa Anna’s forces still numbered some 15,000 upon reaching the environs of Saltillo, where Taylor’s men were encamped at a good defensible position near a hacienda called Buena Vista. The Mexicans—hungry, exhausted, and demoralized as they were—still had a decided numerical advantage, for Taylor had only around 5,000 mostly green troops. Santa Anna was by this time aware that the Americans were preparing an amphibious invasion at Veracruz, and strategically it would have made sense for him to refocus his efforts toward repelling that assault. But Santa Anna could not resist the temptation of enhancing his heroic stature by handing his enemy a glorious trouncing. His army attacked on February 22 and again on February 23, 1847. The fighting was intense and bloody. The Mexicans lost around 2,100 men, the Americans 673 plus some 1,500 desertions. Even with their terrible losses, the Mexicans retained a comfortable numerical advantage. Had Santa Anna chosen to renew the attack on February 24, the Mexicans might well have prevailed. But Santa Anna, persuaded that his army did not have enough food to hold out for another day, decided to withdraw his forces back to San Luis Potosí. The march back was probably as costly as a continuation of the battle would have been. By the time Santa Anna’s army reached San Luis Potosí on March 12, he had lost more than half his original army of twenty thousand. The battle was reckoned an American victory, since it was the Mexicans who withdrew. Santa Anna suffered vicious criticism, including numerous charges of incompetence and treason, for his conduct of the campaign. While the fighting raged in northern Mexico and political factions clashed in Mexico City, President Polk put into operation the next part of his plan—a move that had been under discussion for some time. Polk was persuaded that diplomacy and reason would not work with the Mexicans and that only a solid and indisputable rout would compel them to negotiate. He therefore appointed General Winfield Scott—a man he held in low esteem but whose military talents he appreciated—to head up an invasion of Mexico from the east. Scott’s force of 12,000 landed south of Veracruz city on March 5, 1847, and invited the lightly defended city to surrender. Upon receiving a defiant reply, Scott ordered a bombardment that visited hellish destruction until the city surrendered on March 29. Anxious to move his forces inland before the heat of summer brought the scourge of yellow fever, Scott and his army set out almost immediately for the highlands. The Americans, in their march from the coast, followed essentially the same route that the Spanish conquistador Hernán Cortés had followed more than three hundred years earlier. Both Cortés and Scott landed at Veracruz during Holy Week, making the historical parallel a bit eerie. The symbolism was not lost on either side in the conflict. The American soldiers were voracious readers of William H. Prescott’s volume History of the Conquest of Mexico, published in 1843. They seem to have gained from that work a sense of historical and, perhaps, racial destiny, even while learning a bit about the Mexican landscape and archaeological remains. The Spanish conquest was again invoked when, after the war, General William J. Worth presented President Polk with a fine copy of a famous painting of Cortés. Although Polk frequently and vehemently denied that his war with Mexico was a war of conquest, he does not seem to have objected to the obvious symbolism of the gift: it first hung in the White House and currently hangs in Polk’s ancestral home in Columbia, Tennessee. On the Mexican side, some drew a dispiriting lesson from the conquest analogy. Five hundred years earlier a small crew of Spanish adventurers had been able to lay waste to an enormous empire because the people of Mexico failed to pull together against their common enemy. History seemed to be repeating itself. Other Mexicans sought to use the parallel more constructively: puros did their best to invoke Aztec imagery in hopes of instilling in the Mexican people some sense of racial pride and solidarity and to identify the hated Spaniards with the new conquerors. Efforts to instill pride and patriotism in exhausted Mexican soldiers were fairly futile given the wretched and onerous conditions under which they were made to operate. Many of the troops who had fought at Buena Vista were now forcibly marched hundreds of miles southward, where, under the command of the indefatigable Santa Anna, they dug in to receive Scott’s forces at a jagged mountain pass near the small town of Cerro Gordo. The position seemed well-nigh impregnable, surrounded as it was by a river, hills, and steep cliffs. The Mexican army had a small numerical advantage, with some twelve thousand troops to Scott’s eighty-five hundred, but many of the Mexican soldiers were sick and exhausted. Others had been recently sprung from prison at Veracruz and pressed into service. The Mexicans’ numerical advantage counted for little against the Americans’ superior ordnance, morale, and tactics. The Mexicans suffered a quick and decisive rout, as the U.S. forces seized huge quantities of Mexican munitions and took more than three thousand prisoners. Santa Anna’s army collapsed; he himself was forced to flee on foot, losing the six-thousand-peso payroll for the troops in the process. The defeat at Cerro Gordo was especially demoralizing to Santa Anna, for it took place on his home turf, not far from his beloved haciendas. In fact, however, Scott’s army had its own problems. Some three thousand of his volunteers had enlisted for a year and were now free to go. On May 6, seven U.S. regiments marched off toward the coast to board ship for home. Another two thousand or so U.S. troops were wounded or gravely ill. Making matters still worse, on April 28, ten days after the Battle of Cerro Gordo, substitute president Pedro María Anaya issued a call for well-heeled patriots to form guerrilla units to disrupt the American supply lines along the Mexico City–Veracruz corridor. Other guerrilla units formed spontaneously and without government sanction. The guerrillas were quite successful in making life perilous for the Americans. Scott’s army now consisted of fewer than five thousand healthy men, with no reinforcements expected and no reliable source of supplies. General Scott—who, like Cortés, was gifted in both the military arts and those of diplomacy—was well aware of the dangers of widespread guerrilla warfare. He was also aware that the surest way to spawn guerrilla warfare was to mistreat ordinary Mexicans. He therefore carefully cultivated the goodwill of the common people by sternly disciplining any misbehavior on the part of his troops. He also wisely sought to appease the Roman Catholic clergy, ordering his soldiers to salute priests on the streets, requesting that priests celebrate mass with his troops, and personally attending mass in the opulent cathedrals of the cities. This strategy paid dividends: many top clergymen eagerly betrayed Santa Anna and made common cause with the invaders. Scott’s forces were welcomed into the city of Puebla—a city some sixty miles southeast of Mexico City, known for its conservatism and piety—almost cordially, “more like travelers than enemies,” in the words of the Spanish minister. Nothing came of the bribery scheme. The Mexican congress had greeted news of the Mexican loss at the Battle of Cerro Gordo with a fresh round of defiance: two days after the battle they passed a law declaring it treasonous to so much as discuss treating with the enemy. Santa Anna claimed that this law obliged him to abandon negotiations with the U.S. agents—but not before he pocketed the ten thousand dollars. Santa Anna then told Trist that a U.S. attack on Mexico City would have the beneficial effect of frightening the opponents of peace into submission, enabling him to seize power and make peace. This interesting proposition clearly opened the way for a U.S. assault on the capital; the problem was, neither side was quite sure if the attack would be in earnest or for show. The siege began August 20, 1847, with a pair of battles on the black craggy lava beds to the city’s south. Once again the Mexican forces, though swelled by militiamen and even some Irish deserters from Scott’s army, gave way before the superior U.S. firepower. The battles were costly to both sides, the Mexicans losing some four thousand men and the Americans more than a thousand. Sentiment among Mexican leaders in favor of surrender was by now considerable, but Santa Anna instead proposed a truce. Scott and Trist agreed and waited to see what sorts of concessions Santa Anna might make. The terms Santa Anna spelled out in a memo of August 26 were surprising: Mexico would recognize the independence of Texas, but with the Nueces as its southern border; the Americans must evacuate all occupied territory and raise the blockade of Mexico’s ports; Mexico would consider granting the Americans some trading privileges in California; and the United States must pay all the costs of war, cancel all Mexican debts, and recognize all Mexican land grants in Texas made prior to 1836. With Mexican military fortunes at their lowest ebb, Santa Anna now proposed to end the war as though the Mexicans had won it. Santa Anna’s offer was rejected, of course, but negotiations still proceeded desultorily. All the while Santa Anna was allowing himself to be persuaded by those who advocated continued stubborn resistance. Perhaps the crowning absurdity of the matter was the ultimate sticking point: neither side was willing to barter away its preferred boundary for Texas. The virtually worthless territory between the Nueces and Rio Grande Rivers—a swath of land so arid it could not even support a cotton crop until the 1920s—was nonnegotiable for both sides. The Americans were determined to own the territory so as to maintain the fiction that the Mexicans had sparked the war by invading U.S. territory. Santa Anna believed the territory was essential as a buffer against future U.S. aggression. When the Mexican negotiators made it clear that they would not relinquish their demand for the Nueces boundary, and also that they had no intention of parting with New Mexico or southern California, the truce collapsed. Santa Anna had used the time to improve the city’s defenses, in violation of the terms of the truce. The fighting resumed on September 8 when the U.S. forces attacked an old flour mill known as the Molino del Rey, which they erroneously suspected of housing a cannon foundary. 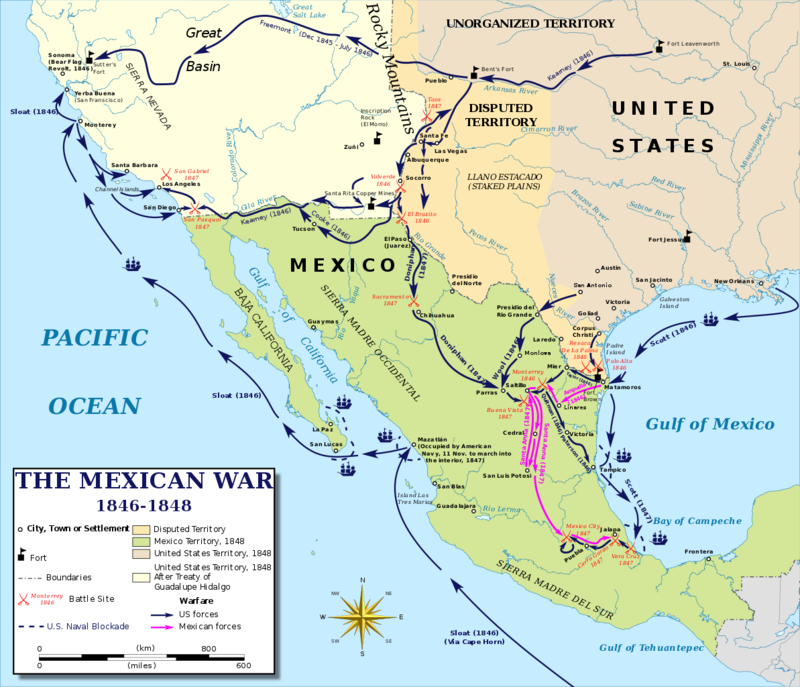 The Mexicans put up fierce resistance, engulfing the U.S. troops in a sustained hail of artillery fire, but after a two-hour fight the Mexican resistance collapsed. Before dawn on September 12 the Americans began shelling Chapultepec Castle, an imposing edifice that had once served as a residence for viceroys but that now served as Mexico’s military academy. The castle, which rested on a hilltop some two hundred feet above the plain, guarded the western entrance to Mexico City. After a full day’s bombardment the castle was badly damaged. On the morning of September 13 the bombardment resumed, followed by an assault. Specially selected U.S. troops used scaling ladders to climb the slopes, breach the castle walls, and engage the castle’s defenders in brutal hand-to-hand combat. By nine-thirty in the morning, the castle had fallen to the Americans. The Battle of Chapultepec provided the ultimate symbol of Mexico’s doomed resistance: six teenaged cadets, ordered to fall back, instead chose to fight to the death. One of the boys, according to patriotic legend, wrapped himself in the Mexican flag and leaped from the castle to his death rather than allow the flag to fall into American hands. Late on the night after the Battle of Chapultepec, Santa Anna resigned the presidency of Mexico, gathered what was left of his army, and withdrew from the city. Shortly thereafter he besieged the tiny and ailing contingent that Scott had left at Puebla, but his army disintegrated as soon as U.S. reinforcements arrived. Santa Anna’s midnight evacuation of Mexico City made him the object of much scorn and scapegoating. When he was summoned to a military court of inquiry, he resigned his military command and made his way into yet another exile. On the morning of September 14 the American forces mustered in Mexico City’s main square while a band played martial music and the Stars and Stripes were raised over the National Palace. Around midday General Scott rode into the square, resplendent in full-dress uniform, to accept the formal surrender of the city. Your title is somewhat confusing as North America consists of Canada, the United States of American and the United States of Mexico.